"Oh no, it's another one of these... These guys need to try harder." "Yeah, try harder DAMNIT, TRY HARDER!" The infamous scene is of course taken from a Beavis & Butthead episode in which the sniggering pair wreak havoc over the video for Pavement's 'Rattled By The Rush'. Not Pavement's best single by any mark, not even close to the best song on 1995's 18-track Wowee Zowee album, 'Rattled', which could only have been considered a slacker 'anthem' by virtue of ensuring it wasn't one. Frontman Stephen Malkmus later said that even he wasn't sure why it had been chosen as a single, putting the decision down to his sizable herbal intake at the time. A 2001 feature in Uncut magazine saw Malkmus downplaying his debut solo album after Pavement as being very similar to the "modestly-successful college rock" of his former band. And here he is again in a recent Rolling Stone interview, where we find him describing his new album, Wigout At Jagbags (that title! ), remarking that "nothing classic is probably going on here, let's face it". Well that's me sold. But let's not forget that Malkmus, the press-styled 'King of Slacker-Rock', is also a high priest of self-effacement. His particular brand of charm-offensive makes him impervious to criticism, anticipating his detractors before they've even had time to fire shots. So he's past his prime, don't you think he already knows? This album's not going to win him any new fans, and he's certainly no stranger to losing them. Malkmus may as well play out his wilderness years in shlumpy dad-rocker style while he waits around for Parquet Courts to blow up and revive his career, career, career. In the meantime Malkmus is bullet-proof, a Teflon underdog with nothing to lose because there never was anything to lose. You can't take apart Wigout (I mean, could you BE any more Malkmus?) 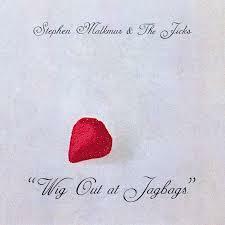 at Jagbags without first having to overcome the fact that Malkmus never liked to be seen as someone who tried anyway. True, up until Pavement's second album, Crooked Rain, Crooked Rain everything was genuinely scuzzy, badly recorded and played in such a haphazard way you'd think the band barely knew what a beat was. The song 'Conduit For Sale' was an inverse manifesto, Bob Nastanovich's "I'm tryin'/I'm tryin'/I'm tryin'/I'm tryin'" refrain, not intended to be taken literally. Since then Malkmus has made a point of cloaking himself in a veil of studied slovenliness, one which belies his growing talent as a musician and songwriter. This reticence has been thrown into sharp relief on many occasions – the crisper production values on Crooked Rain, the tightly-wound genre exercises on Wowee Zowee, Brighten the Corners' absurdist lyrical play and Terror Twilight's forays into expansive art-rock as found on the Nigel Godrich-produced 'The Hexx'. More recently it's been Malkmus's emergent interest in progressive rock whose intricacies have felt at odds with his garage band roots. He may not have released anything 'classic' since 2003's excellent Pig Lib - an album which epitomised the Jicks era with ragged, meandering songs that nevertheless exhibited remarkable fluency and technical style, but by 2008 these indulgencies were being met with increasingly mixed reactions. Real Emotional Trash featured extended Sabbath-inspired solos and kitschy-witchy song titles like 'Hopscotch Willie' and 'Wicked Wanda'. But no matter where you got off the Malkmus boat (if indeed you ever did), there's no denying a feeling of progression with each successive release, a definitive career arc that suggests Malkmus had always been challenging himself; that he had, in fact, been trying all along. Wigout At Jagbags (for Pete's sake) is the first album in Malkmus' long career which feels like he's actually stopped trying. Texturally there's very little change in formula from the last record, Mirror Traffic - a competent guitar/bass/drums set-up playing the by-now familiar Jicks brand of clever-sloppy indie rock which sounds a bit like early Yes after a burglary. It's not that the songs aren't well-constructed – musically they are, with special attention given to the defiant signature-changes and twisting melody lines that have come to define Malkmus' songwriting in recent years. But for all the clever twists and turns it's clear the Jicks are on autopilot by now and all too often it's only the more obtrusive moments on Wigout At Jagbags that stop the songs drifting by largely unnoticed. Let's look at 'Lariat', a bromide commentary on rock nostalgia boasting a gimmicky internal rhyme scheme and a chorus that reclaims the "Oh my God/Oh your God/Everybody's God" format from Pavement hit 'Shady Lane', except in a much stupider way. If you can find charm in rhyming 'venison' with 'Tennyson' then surely "You're not what you aren't/You aren't what you're not/You got what you want/You want what you got" must be enough to get your teeth grinding. There are just too many occasions where Malkmus' tone bypasses droll, flies directly over kitsch, and lands way out in the rough with no hope of ever retrieving the ball. "Scattegories, categories… Condoleeza's rice/Scattered on the floor" is cack-handed word association masquerading as wordplay. This is no "Lovely blue incandescent guillotine", no "Eating her fingers like they were just another meal". These are lines that would make a Gallagher brother blush; assonance at its most asinine. What happened to our lyrical court jester, the guy who once came out with couplet gems like "The lion reaps his own reward/Serengeti nightmare for the eco-tour"? He's now your goofy out-of-touch uncle reeling out groansome one-liners and dated pop culture references at the dinner table. Has it ever been acceptable (for anyone other than Eminem, of course) to rhyme 'ladies' with 'Slim Shadies', let alone in 2014? These are puns so awful I'm not even sure they qualify as puns. I'm not even sure it's self-parody any more. And to be honest I don't care. I don't care because Malkmus doesn't seem to care. He doesn't give a gnat's fart if I care, so why should I waste my time? One song starts with a sample, a Cockney shout of "THIS ONE'S FOR YOU, GRANDAAAD!" It's funny because he's kind of getting on a bit, see? No doubt any actual statements about growing older will have to wait until he achieves true elder statesman status in a few years' time. Until then Malkmus seems content to thrash out another album every couple of years, to placate the few enabler-fans who continue to embrace his foibles, and to treat the rest of his audience with a narcissistic contempt that will make them wonder what they ever liked about his music in the first place. We know he's better than this – we've heard the evidence! C'mon Malkmus, TRY HARDER DAMNIT! TRY!